On Day 2 of the Roosevelt Rendezvous we selected the “Hellroaring to Home” outing, mainly because of the name. The hike sounded interesting, but c’mon: Hellroaring. 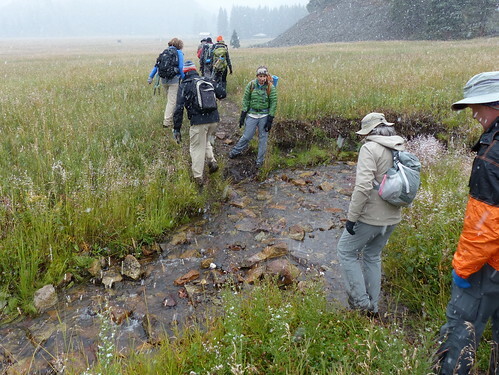 The trailhead takes its name from a creek that flows to the Yellowstone River. Old-time prospector A.H. Hubble named it so in the 1860’s, when asked about the creek that lay ahead of his party. “It’s a hellroarer”, he said. There’s a very good chance that I’ll be using this phrase soon, when asked to evaluate something. “How’s that quinoa and kale salad?” “It’s a hellroarer.” Our excellent guide Danielle walked us down the trail, and stopped every so often to describe one of the many native plants, now in fall color regalia. Here’s a look at the country around there. That cone-shaped peak is also named Hellroaring (why not? 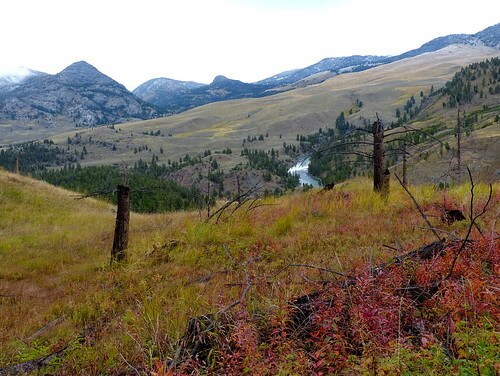 ), and you can see the Yellowstone down in the canyon. Danielle knew all about the plants, and described their therapeutic, nutritional, and toxic properties. The plants also had good common names, and even a week later I think I’d be able to identify the fireweed, ghost berry, ninebark, yarrow, chokecherry and pepperweed plants. I expect the spring wildflowers are excellent here as well. 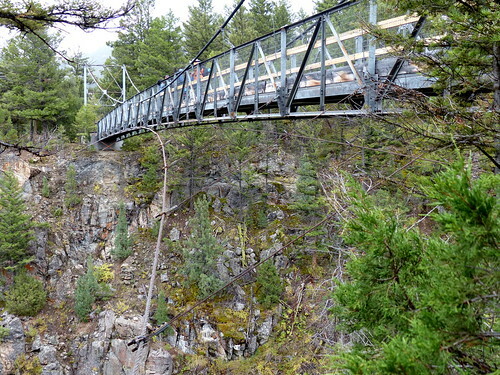 The trail winds down to a suspension bridge across the Yellowstone. I examined it closely with another hiker, and we speculated about the engineering behind the anchoring system, and the durability of the wound-wire cables. Aren’t we supposed to be looking at Nature? I guess we haven’t left our urban sensibilities behind yet. It is a cool bridge though. The trail continues on beyond the bridge, but we doubled back to a trail that would return us to Roosevelt (hence the Hellroaring to Home name). 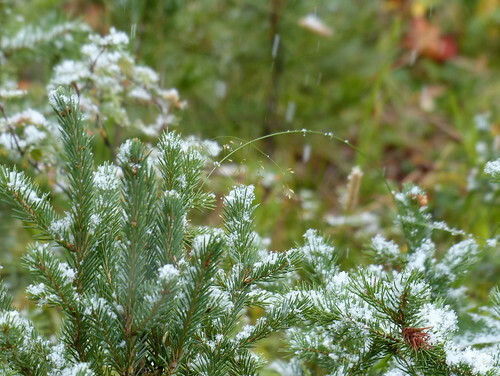 As we started back up the trail, the first snowflakes started falling. The snow never amounted to much – it barely landed before melting. Not a Hellroarer or anything like that. It was very pretty though. 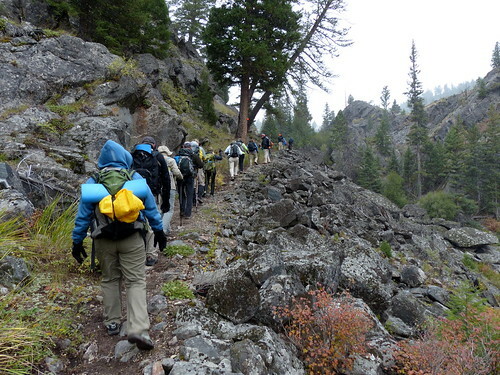 The trail brought us into Cat Country, the favored habitat of Yellowstone’s elusive mountain lions. You could just feel they were up in the rocks, watching our hiking party pass through, looking for the weakest individual. To take my mind off being the weakest individual, I struck up a conversation with the fellow behind me. He’s a big-timbered, sonorous-voiced gent with a large mane of white hair, and hails from Oklahoma. To get things started, I confessed that I knew little of Oklahoma, and wondered if they also had mountain lions. His response was unusual, in that I expected either, “No, we don’t.”, or “Oh sure.”, and we’d continue walking on in uncomfortable silence. But that’s not how conversation goes in OK, apparently. In response, he first laid the groundwork by describing Oklahoma’s half-dozen ecological zones, the number of rivers that cross it, and the hills that can be found in the state, and finally, evidence in those hills of recent mountain lion attacks. So, it took a few paragraphs, but we have our answer. This tells me that in places outside of our go-go urban confines, people will take the time to answer your question in full, and assume that you’re interested enough to listen, since you asked. I would be interested in seeing Oklahoma some day, now that I’ve heard all about it. Here we see the Resident Expert crossing a creek (not the Hellroaring) on our way to our lunch spot. 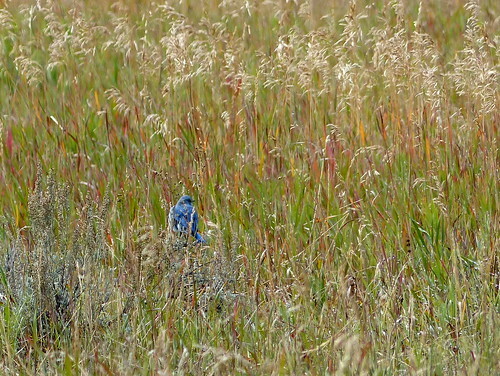 The light snow stopped during lunch, and a few birds showed up, including the Mountain Bluebird and our friend Raven. 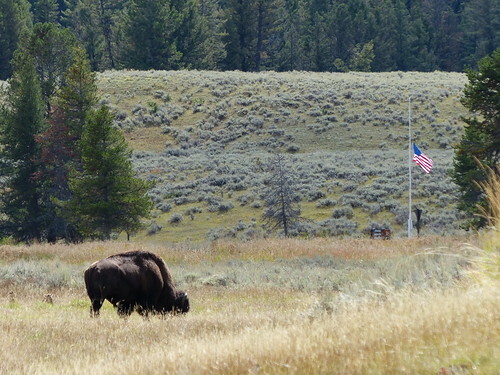 We had to wait to cross the meadow and return to the lodge, due to some lingering bison. This large fellow is browsing across from the Tower Ranger Station. You’ll note the flag is flying at half-mast, as the date is September 11. Back to the lodge, where the coffee was still hot, and we enjoyed some out on the porch. 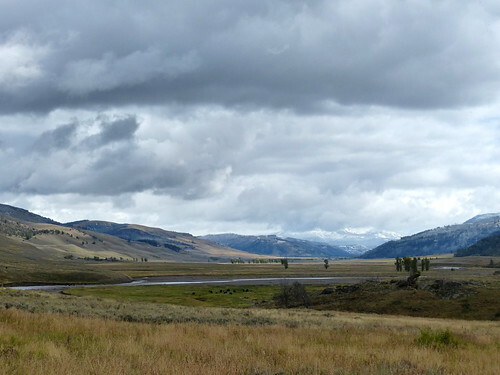 After regrouping, we drove out to Lamar Valley to maybe see some of the charismatic megafauna the region is famous for. Out in Icebox Canyon we did finally see a mountain goat, which had eluded us in our 2013 visit. Some people pointed it out to us, otherwise I’d never have seen it. 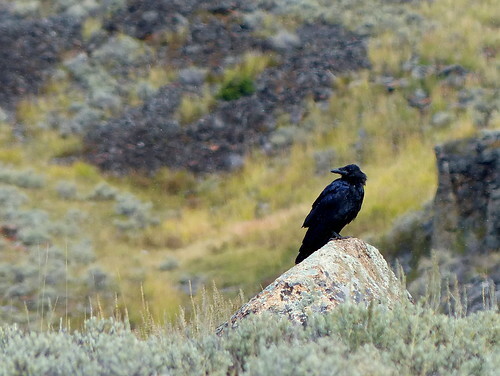 They also said they saw a grizzly bear and yellow-headed blackbird earlier in the day. In hopes of seeing more animals, I almost suggested that we follow them around for the remainder of their trip. But that might come across as a little weird. There were plenty of bison and pronghorn to be seen in Lamar, along with spectacular scenery. This evening’s after-dinner presentation was from local photographer (and wildlife biologist) Brad Orsted. He provided good photography tips, and was pretty funny as well. But his best guidance was to not have preset notions of the lighting, temperature, crowds, and abundance or lack of animals, and just “take what the park gives you”. Good advice. This could be applied generally, it seems, by substituting other words for “park”. And it is really getting cold tonight, because the clouds have cleared. The Vogelzang stove is not up to the task, and no matter how much wood I toss in there, we can still see our breath. Fortunately the Resident Expert has brought suitable garments for such conditions. Another full day is ahead of us, and I will tell you about that in a future communication. Stay tuned.